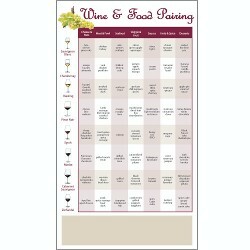 Here is a great wine advertising product for wine tastings or wineries – Ad copy or logo appears at the bottom. This simple guide suggests what types of food might go with each kind of wine. This is a great item to giveaway at wine events or tradeshows, and can serve a number of different advertising event efforts.